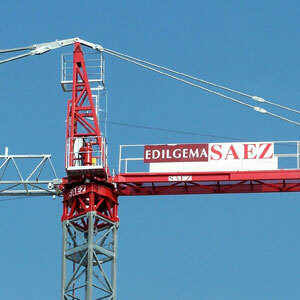 New Crane Sales| Edilgema S.r.l. Our company sells new cranes and provides a wide selection of guaranteed and certified products to meet your job site needs. We sell high quality cranes at a fair price, providing reliable products that are suitable for the countless needs which may arise during construction works. 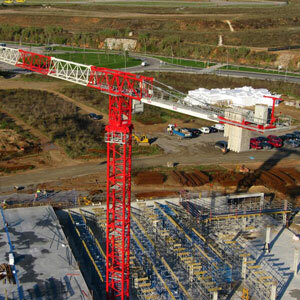 In the construction crane sales area we offer various models: fast-erecting cranes, tower cranes and flat top cranes from SAEZ, a synonym of quality and efficiency. Each product undergoes testing and trials prior to sale in order to provide you with absolutely reliable construction cranes at an extremely reasonable price. Besides selling new cranes, we also provide our customers with other additional services such as crane maintenance, crane mounting and spare parts. Browse through our products and contact us if you need any technical information or to ask about model availability. 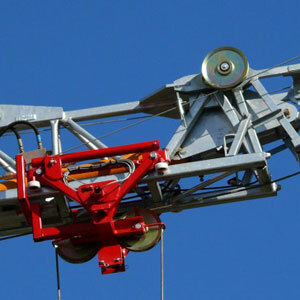 The new hydraulic mounting cranes are the best example of the most modern technique in hoisting. The solid and compact tubular structure allows for extremely easy transportation and mounting. The range includes models with reaches from 24 to 32 m and load capacity from 700 to 4000 Kg. The “City Crane” tower cranes with hot galvanized tower and boom provide significant savings in terms of transportation, quick mounting and adaptability even on job sites with reduced spaces. The range includes models with reaches from 24 to 52 m and load capacity from 1000 to 4000 Kg. “FLAT TOP” tower cranes without tie rods, because of their reduced height, are particularly suited for job sites where there are other cranes which means overlapping reaches. The range is divided into the “TL” category, with galvanized boom and tower and models that have reaches from 30 to 55 m and load capacity from 1,000 a 5,000 Kg, and the “TLS” category, with reaches from 30 to 65 m and load capacities from 1,650 to 8,000 Kg.